Because John Edwards' health care plan is not an outright single-payer plan many people mistakingly believe he does not favor such a plan. Not true. What he has said all along is that it should be up to the public, not politicians, to decided the kind of health care system they want. The essence of Edwards' plan is to allow health care consumers to make the choice between traditional private insurance and government plans. The Edwards plan will allow consumers the choice between traditional private insurance and a government plan modeled on Medicare (single-payer). It would be the consumers making the choice, and if they chose to go for the single-payer plan, well, that's just fine with Edwards. This is in keeping with a basic theme of the John Edwards for President campaign. Empowering people to make choices and giving them the tools and the help they need to be responsible citizens. Private insurance is in business for one thing. To make money. That is one of the reasons they funnel about 30% of premiums away for actual health care and into healthy profits for executives. Medicare, on the other hand, spends about 3% on overhead. The rest is put into taking care of health needs. If the government is able to undercut private insurers on price — by forgoing profit, reducing overhead, and maximizing economies of scale — it theoretically could put the private system out of business and become the de facto insurer for the nation. "I thought that there was a legitimate and strong argument for it," he said. "But I also believed that there are an awful lot of Americans who like the health care they have and are nervous about entirely government-controlled health care." One doesn't have to go further than the debate over health care here in California to know how true that is. As people take sides for and against the Schwarzenegger/Nuñez plan, a single-payer plan is waiting in the wings. State Senator Sheila Kuehl's SB 840 has been labeled a "government-controlled health care," but sometimes we need government to control systems that have lost control or have shown they can no longer be trusted to be self controlled. Perhaps a plan similar to the Edwards plan is right for California. Empower consumers to make their own choice. If they move toward single-payer great. If they don't that's okay too. But at least they get to make the choice, not some politician in Sacramento or Washington taking money from the insurance industry. Let consumers make the choice. It is very exciting here in Las Vegas. The energy in the Edwards camp is very high. I got the opportunity to attend a town hall meeting this evening at the Carpenter's Hall and the people present were enthusiastic and energized. Senator Edwards looked relaxed and did a great job. After his speech, Senator Edwards took questions from the audience. He was asked by a young man if he was going to save the earth from pollution. Of course, the answer is to get us off our dependence of oil, change the emission standards on our vehicles and set the example to the world that we are willing to save our planet. Only then, will we make the planet better for this young man. A woman sitting next to me asked about Senator Edwards' position on pulling troops out of Afghanistan and was his position on Afghanistan troop withdrawal different from Iraq. John said that he views Afghanistan in a different way than Iraq. He would leave troops in Afghanistan until we had completed the mission in capturing Osama Bin Laden, reduce the heroine trade and deal with the rule of the Taliban. I spoke to her briefly afterward and she said she had asked the same question of Barack Obama and Hillary Clinton and did not feel she got a satisfactory answer. She felt that John had given her a straight answer tonight and will caucus for him on Saturday. It is this same straight answers on the issues I care deeply about that have made me his supporter since the first time I heard him at the library in Sacramento in 2004. If the conference I am attending here is Vegas affords me a second opportunity to go make calls or do work for the campaign, I will do so again on Thursday evening. My co-workers attending this conference think I am kinda nuts for being so involved politically. My only answer back is, I don't think any of us can sit by the sidelines in this election and be a spectator of the process. I know that once I get back to CA, I will do what ever I need to do to get the word out about the next President of the United States - John Edwards!! Last night I spoke to the Sierra Foothills Democratic Club in El Dorado Hill on behalf of John Edwards. Below is the text of my comments as prepared for delivery. Thank you, Sierra Foothills Democratic Club for inviting me to speak on behalf of Senator John Edwards. If you get all your news and information from mainstream media you may not have heard about it yet, but Senator Edwards is running for President of the United States. I probably over thought what I could tell you about Senator Edwards this evening. I could tell you about his plan for universal health care that puts us on the road to a single payer system. I could talk about his plan to immediately withdraw between forty and fifty thousand combat troops from Iraq. I could talk about his support for middle-class families and working Americans. His education proposals may interest some of you, and his energy plan works toward energy independence and fights global warming. I could also spend some time talking about his plan to revitalize rural America. Sure, I could bore you with the details of Senator Edwards’ bold initiatives, but, if you get your news from alternative media sources, you’ve likely heard them — or something similar to them — already. You see, each of the Presidential candidates also have plans that are similar to Senator Edwards’. On the issues, there is little difference between the candidates. The difference is, Senator Edwards proposed his plans before any of the other candidates, and many of the details of his plans were incorporated into their plans. If imitation is truly the sincerest form of flattery... well, John should be flattered. Senator Edwards’ plans are nothing new. They are Democratic Party principles put to pen and paper and laid out before the American people. They are bold, honest plans to lead America forward. You can read the details of his "bold solutions for real change" at www.johnedwards.com. Now that I have not told you briefly about Senator Edwards’ plan, I would like spend the remainder of my time telling you why I support him. People ask me, "why support someone who the media ignores, isn’t polling with the ‘front runners,’ and doesn’t appear to be able to win?" 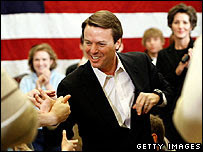 My support for John Edwards goes back about four years to the last presidential election cycle when I first heard him speak at a library in Sacramento. After hearing him speak, I told my wife Marcie that I felt like I had just heard the next President of the United States. She agreed, and we have been ardent John Edwards supporters ever since. We were understandably disappointed when he dropped out of the race early and the angry when the Republican election theft cost him the Vice Presidency. Since then, Edwards has been working to bridge the gap between the "Two Americas" that he so eloquently described during the earlier campaign. Our support has grown, and we were relieved to see him enter the race for 2008. As it turns out, in 2004 I hadn’t heard the next President, but I do believe, and I hope, for America’s sake, I heard the person who will become President in 2008. John Edwards gives me hope, but more than that, he instills in me the confidence that we are a people and a country that is better than what we have experienced over the last eight long years. I am impressed that Edwards is the only candidate that is talking to the heart of people, he is the candidate that focuses, not on the rich and well healed, but on the poor, on the people that have been left behind and forgotten by a political system that cares more about the size of your pocketbook than the size of your heart. To be sure, there are important and critical issues that must be addressed, and John Edwards addresses them all, and he is the only candidate that is standing up for working and middle class families. He stands with us on true universal health care. He stands with us to strengthen the labor movement. He stands with us, taking on abusive lenders and helping families get ahead. He stands with us, strengthening schools and making college affordable. He stands with us, building a better future for the next generation. He stands with us to end the occupation of Iraq and restore America’s moral leadership. He stands with us creating opportunity for all. 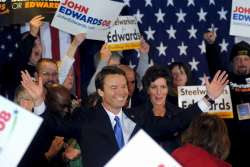 Simply put, I believe John Edwards to be the best hope for America in these times. It may not matter much to some people, but I feel it here, in my heart, and here, in my gut. It matters to me. Don’t get me wrong. Any of the Democratic candidates will move America forward. Any of the Democratic candidates will be a welcome change from the failed policies of the Bush administration. And, whoever the Democratic nominee is, I will support them. But, John Edwards has given me — he has given all of us — hope that goes deeper than any of the others. He has given me confidence that his bold policies for fundamental change will take hold. He has given me a vision of an America where people, average working stiffs, you and me, matter and make a difference. I am amazed at the number of people I talk to and hear from who say that they like what John Edwards is saying. They like his policies, agree with him on the issues, and support his bold initiatives to renew hope in America. They even tell me that they align more closely and agree more ardently with John Edwards than the others. Then they look at me and say, "But I’m going to vote for someone else." Why? When did we start settling for our second or third choices? We will be voting in a primary election on February 5, and you should vote your heart, your mind, your conscience. You should vote for your first choice, your gut choice, the candidate of your heart. The one with whom you align with closest. And if you are like me that choice will be John Edwards. Here’s a novel concept. On February 5, instead of voting for the media favorite, vote for the person you want to be President. The press may be trying to spin this as a two-person race — but the voters in Nevada are saying differently. According to the latest poll from the Reno Gazette-Journal, it's a dead heat — with the momentum moving in John Edwards' direction. Can you help us build on this momentum as we reach out to caucus goers around the state? More than 500,000 caucus goers have been contacted by thousands of volunteers over the past two months. Just this past weekend, 15,000 potential caucus attendees were personally canvassed by volunteers from our campaign who fanned out across the state. The momentum is breaking John's way at exactly the right moment — but we need your help to put additional resources into Nevada immediately. Now is when it counts. Please show your support for John — and help us pull off a strong finish in Nevada this Saturday. A strong finish in the Nevada caucuses means this is still a three way race for the nomination. It means the two $100 million candidates will be forced to compete on the issues that matter, unable to buy the nomination with glitz and glamor. Your contribution helps us get the extra resources we need into Nevada now, so we can maintain the momentum, expand our ground operation — and hold off any last minute desperate attacks from the other candidates. John has said that he intends to continue this campaign all the way to the Democratic Convention, win the nomination and then on to the White House. A strong finish in Nevada will be an important step in that journey for our campaign. It will shock the pundits and reshape the dynamics of this election. You can make the difference now. Please take a moment and show your support for John with a contribution to help us finish strongly in Nevada this Saturday. P.S. Don’t forget to watch the Nevada debate tonight on MSNBC at 6:00-8:00 pm PST / 9:00-11:00 pm EST! CMR has corrected the mistake and is now running a legitimate poll between Clinton, Obama and Edwards, thanks to a letter from Arlene Flores of La Quinta. The folks at California Majority Report are polling to see who readers think will win the Democratic Primary. There is only one problem, they left off John Edwards, the only real voice for real change. They do have Mike Gravel in the poll. Obviously, the unscientific poll is designed to skew the result towards Steve Maviglio's choice, Hillary Clinton. For those who don't know, Maviglio is on Speaker Nuñez staff. They are obviously afraid that Edwards will embarrass Clinton. Here's what to do. Go to CMR and vote for Mike Gravel. If you want to cast your vote for Edwards, do it in a way that really can make a difference and click below to make a donation to his campaign. Leading Economists are endorsing John Edwards in a Press Release from the Edwards Campaign dated today. Chapel Hill, North Carolina – Today, the John Edwards for President campaign announced that more than 30 leading U.S. economists have endorsed John Edwards for president. "Economists for John Edwards" includes such notable scholars as James K. Galbraith from the University of Texas at Austin; Deirdre McCloskey from the University of Illinois at Chicago; Thomas Palley, founder of the Economics for Democratic & Open Societies Project; Clyde Prestowitz, president of the Economic Strategies Institute; Harley Shaiken from the University of California, Berkeley; and Edward Wolff from New York University. "I'm proud to endorse John Edwards and his campaign to build One America.," said James Galbraith, the Lloyd M. Bentsen, Jr. Chair in Government/Business Relations at the LBJ School of Public Affairs, University of Texas at Austin. "Edwards understands that in order for America to prosper, our economy needs to reward work as well as wealth – and he's proposed detailed and comprehensive policies to address the growing income gap, the health care crisis, job loss and the other critical social issues facing our nation." "I am honored to have earned the support of this distinguished group of economists," said Senator Edwards. "Today, families across the country are working harder than ever, but struggling to make ends meet. To help middle-class families get ahead, we need a president who will fight for universal health care, smarter trade policies and a new energy economy." "As professional economists, we support John Edwards for President of the United States in 2008 because we believe that John Edwards has best demonstrated the capacity and the policies to be the next president of the United States. "We support John Edwards because we believe his campaign is the single best expression of progressive political values in American politics today. "We support John Edwards because we believe that as president he will best wage the hard fight that lies ahead for the principles and programs we endorse. "We support John Edwards because as economists, we seek effective public policy aimed at sustained growth, full employment, an end to poverty, and progress toward solving the major social and environmental problems associated with health care, education, trade, taxation and climate change. "John Edwards' approach to these issues has been uniquely serious, honest, and far-reaching. We urge all Americans – and particularly the Democratic voters of Iowa, New Hampshire, Nevada and South Carolina - to join us in supporting John Edwards for president." A complete list of the members of "Economists for Edwards" is included below. Richard McIntyre Honors Program Director and Professor of Economics University of Rhode Island. CONCORD, N.H. – John Edwards has a simple philosophy when it comes to fine-tuning his message for New Hampshire: if it ain't broke, don't fix it. Edwards regaled a crowd of more than 200 this morning with indictments of corporate greed and lobbyists' grip on Washington D.C., along with pledges to fight for universal health care, fairer trade deals and an end to the Iraq war. He proclaimed himself the underdog in Tuesday's primary, but added "the real underdog in America is the middle-class, the low-income families in America who are struggling just to survive." It's essentially the same pitch Edwards gave Iowans in the weeks leading up to his second-place finish in the Jan. 3 caucus (won by Sen. Barack Obama), and it's very similar to the language he employed on an early-fall swing through New Hampshire. And it stands in contrast to several other candidates touring the state this weekend, who have retooled their messages to appeal to New Hampshire's independent-minded voters and to incorporate lessons from the Iowa results. Edwards aides call the success of the former North Carolina senator's message the "unwritten story of Iowa." The Edwards field organization targeted 42,000 Iowans for caucus-night turnout, spokesman Mark Kornblau said. Some 80,000 Iowans ended up choosing Edwards. "They went and caucused for him based on this message," Kornblau said. The biggest tweak in Edwards' speech post-Iowa is his attempt to re-frame the nomination fight as a battle between what he calls the two "change candidates" – himself and Obama - and excludes Clinton, who was long perceived as the national frontrunner. Edwards differentiates himself from Obama largely by saying he'll take a more confrontational approach to corporate interests, particularly insurance and pharmaceutical lobbyists, when pushing issues such as universal health coverage. In Concord this morning, Edwards let his favorite campaign surrogate – his wife Elizabeth - distinguish him from his two leading rivals in much bolder terms. Elizabeth Edwards said her husband had reacted more presidentially to the assassination of Pakistan's Benazir Bhutto, telephoning the Pakistani president to plead for democratic progress while his rivals "raced for the microphone". She said he was the most dependable to negotiate fairer trade and the only one of the trio to oppose new nuclear power plants.Without naming names, she said his health care credentials trumped Obama – whose plan would leave an estimated 15 million Americans without insurance, because it does not mandate health coverage – and Clinton, who had the chance to achieve universal care under her husband's administration a decade ago and instead chose "to spend (her) political capital on passing NAFTA." She also said two candidates had voted for Iraq war funding without withdrawal timelines attached – again, Clinton and Obama – but didn't mention her husband's since-repudiated vote to go authorize the war in the first place. Asked if Edwards himself would soon start drawing bolder contrasts with his opponents, Kornblau replied "there's time for that." Reminded that only three days remain before the New Hampshire primary, he replied "there's lots of time after Tuesday." The Nation -- Politico reports that consumer crusader and former presidential contender Ralph Nader has expressed "strong support" for John Edwards. Nader has been edging toward this "endorsement" in the last couple of weeks. In an appearance on "Hardball," in mid-December, he said Edwards "now has the most progressive message across a broad spectrum of corporate power damaging the interests of workers, consumers, taxpayers, of any candidate I have--leading candidate I have seen in years." He went on to explain that "the key phrase is when he [Edwards] says he doesn't want to replace a corporate Republican with a corporate Democrat." Nader told Politico, " it's the only time I've heard a Democrat talk that way in a long time." For Ralph Nader--and take my word for it, please--that is rare praise for a leading Democratic politician. In throwing his support to Edwards, Nader was scathing in his criticism of Hillary Clinton--calling her a "corporate Democrat ...[ who ] ... has not led the way against the avalanche of military contracting, corporate crime, fraud and abuse." Edwards' passionate populism, which has been dismissed in too many mainstream articles in the past weeks as "angry" or "over the top," is speaking to the reality of the concentration of power and wealth in a few hands--a concentration that is working against the vast majority of Americans. Why is what Edwards is saying "over the top" when 72% of the American people told "Business Week" in 2000--- that corporations have too much control over their lives and jobs. Will Nader's support encourage progressive Iowans to give him a win in Thursday's caucuses? Hard to know. This is an extraordinarily fluid, tight, ideologically fascinating race in which progressive champion Dennis Kucinich has just urged his supporters to go for Barack Obama in a second round. And there's no question that Nader remains controversial among many progressives who believe that he took enough liberal votes from Gore in 2000 to give Bush the presidency. Whatever happens to Edwards in Iowa, his full-throated populist message is unlikely to disappear from this race. Clinton and Obama are already sounding populist appeals in their speeches. It's up to progressives to keep the heat on so that taking on corporate power, taking back govenment, empowering workers and disempowering the lobbyists remains a cornerstone of small-d politics in 2008 and beyond. As Nader says, "Edwards is at least highlighting day after day that the issue is who controls our country: big business or the people?"